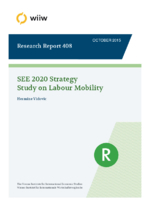 The study focuses on cross-border mobility in the Western Balkans, which has been identified in the SEE 2020 Strategy as contributing positively to generating employment, reducing the skills mismatch and increasing the productivity of the countries of the region. So far labour market liberalisation in the Western Balkans has made little progress; almost all countries rely on quota regimes. With the exception of Montenegro and Croatia, the majority of labour migrants come from outside the region, a significant share of them with higher education. Regional migrants are generally lower skilled than workers from outside. Montenegro attracts the major part of regional migrants, while Serbia and Bosnia and Herzegovina are the biggest sending countries. Potential migration/labour flows of the Western Balkan countries within the region and into the EU-14 and the new EU Member States-10 are analysed by adopting a gravity modelling approach. Accordingly, lifting restrictions on labour market access increases strongly both migration flows to EU-14 as well as intra-regional flows. If macroeconomic indicators (employment rates and GDP per capita) improve further in the Western Balkans then this causes a certain amount of redirection of mobility from extra-regional mobility (i.e. less migration to EU-14) to more intra-regional mobility.